Perpetually pink blonde socialite Elle Woods (Reece Witherspoon) turned successful lawyer returns in the sequel to 200’s hit comedy Legally Blonde. However Elle has more important matters than her law career to attend to, whilst planning her wedding to Emmett Richmond (Luke Wilson – who has very little screen time – his career will thank him) she decides she must have her long-time friend, and dog, Bruiser’s parents in attendance. Elle manages to track down Bruiser’s mother, who it turns out is being subjected to animal testing in the name of science. Horrified Elle sets out to not only free Bruiser’s mother, but to have animal testing banned, creating quite the stir in stuffy Washington as a result. Yes, the plot is that stupid. Legally Blonde 2 is nothing more than a slapped together sequel to cash in on the popularity of the original, nothing more, and nothing less. Quite why talents like Witherspoon, Wilson and Sally Field (slumming it!) signed on is a mystery, I guess someone backed a big truck of money up to their door – at least I hope so, I would hate to think anyone though this film was a good idea! Many of the story points of the superior original are repeated, Dana Ivey’s Congresswoman Hauser standing in for Holland Taylor’s judge, Regina King’s Grace Rossiter follows the same enemy to ally arc of Selma Blair’s character etc. none of them offering anything new. Jennifer Coolidge is amusing but wasted, as are Jessica Cauffiel and Alanna Ubach as Elle’s airhead sorority sisters (although their plea to congress is perhaps one of the true genuinely funny moments of the film). Perhaps the biggest mistake is that Elle Woods has been dumbed down as a character (I mean inviting your dogs parents to your wedding?!? ), with Witherspoon seemingly okay with this – even if the audience are not! 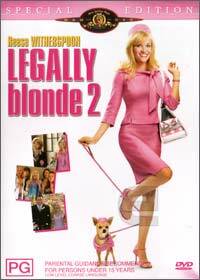 The DVD of Legally Blonde 2 is packed with special features various behind the scenes featurettes, deleted scenes, gag reel, audio commentary and much more. Unfortunately all the DVD extras in the world can’t save the film from sucking – rent or buy the original instead.